Update: on 20 July, the two women passengers involved were each sentenced to a year in jail under Section 10 (a) of the International Trade in Endangered Species Act 2008. They were the first to be prosecuted under the Act that came into force on 28 June and provides for a maximum fine of RM100,000 per animal or plant but not exceeding an aggregate of RM1 million (USD316,000), or to imprisonment for a maximum term of seven years, or both, for importing or exporting any scheduled species without a permit. 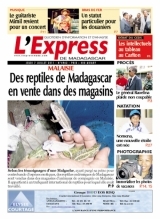 More evidence Madagascar is being plundered by illegal traffickers from SE Asia: http://bit.ly/d51YU6.